Posted on Tue, Jan 17, 2012 : 4:46 p.m.
Photo from Flickr user dsearls. It's a cruel twist of fate that brings Ann Arbor Restaurant Week smack in the middle of our annual post-holidays resolution to eat less and get into shape. Just when we're ready to dive into a three-course prix fixe meal, we're reminded that swimsuit season is just around the bend. But all is not lost. 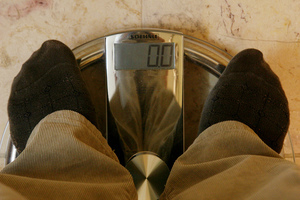 NPR's Allison Aubrey has a story up on How To Eat Out Without Putting On The Pounds. The secret, according to a new study in the Journal of Nutrition Education and Behavior, is to eat mindfully. Slow down. Savor each bite. A group of women who participated in the study completed a six-week mindful eating program and each lost an average of 2.2 pounds. You can read the full article on the NPR site. Wed, Jan 18, 2012 : 6:36 p.m. SATISFACTION AND SATIATION : I would like to ask the readers to make a distinction between the terms, satisfaction, and satiation. In human physiology, the feeding activity is generated as a response to stimuli like hunger and thirst. Most of us consume food in response to social stimuli apart from physiological stimuli. We tend to stop eating when we experience satiation or satisfaction of hunger. But, man is a creature of his emotions. Man seeks satisfaction from his living condition. He lives to find satisfaction in life. Man always exists with an inner sense of dissatisfaction about his life. The reason for this sense of dissatisfaction is not apparent and man may not have cortical awareness of the reasons for this dissatisfaction. Food may give satiation or satisfaction from the pangs of hunger, but may or may not fully satisfy the needs of the man to find satisfaction in his life. Man may have to seek a connection with a source that could provide a sense of satisfaction and must not depend upon food alone. In this context, I use the term spiritual connection which means finding a relationship, a partnership, an association, or bonding between man the food consumer, the food, and the source of satisfaction. I view food as a spiritual substance and consume it to formulate my relationship with my source of satisfaction in life. In the last 25 years of eating, I have not gained any additional weight and I have never starved myself and I do not fast for any reason like Lent or Ramadan.